Unmatched performance, flawless Crystal Sound 2 audio and customizable Turbo App for your X99 build. Patent Pending OC Socket – Drive CPU and DDR4 performance beyond all expectations! 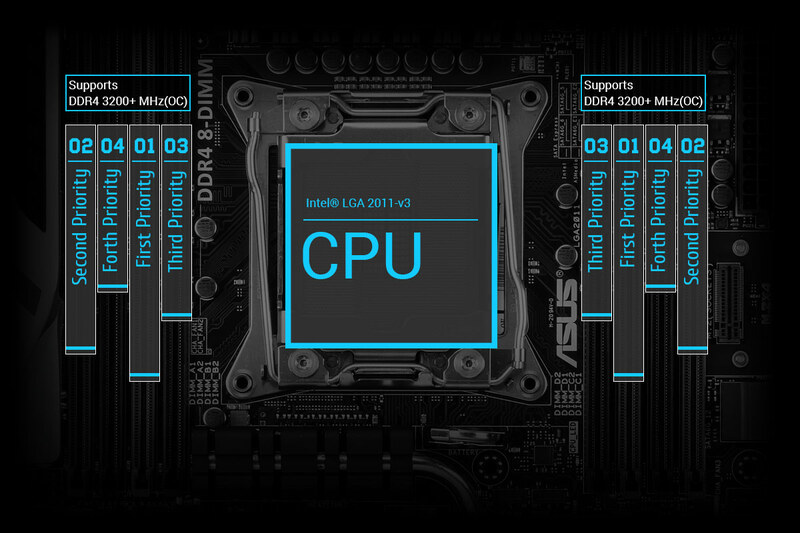 5-Way Optimization by Dual Intelligent Processors 5 – One click overclock and cooling, done! Crystal Sound 2 - Flawless audio that makes you part of the game! Total control anytime, anywhere with Remote GO! Drive CPU and DDR4 performance beyond all expectations! Designed to break performance barriers, ASUS OC Socket utilizes extra pins to connect a proprietary circuit to contacts found on Haswell-E's land grid array (LGA). Combined with our customized UEFI, this exclusive feature enables higher DDR4 memory frequencies, lower latencies and enhanced stability while overclocking, extending all the way to extreme overclocking conditions, such as Liquid Nitrogen (LN2). OC Socket is 100% compatible with new Haswell-E LGA 2011-v3 CPUs, ensuring the ideal combination of overclocking performance and compatibility. One click takes care of all that complex tuning. Your PC is smart with ASUS 5-Way Optimization. It dynamically optimizes essential aspects of your system based on real-time use – so you get superb CPU performance, everyday energy savings, ultra-stable digital power, cool and quiet fans and now even networking and audio settings that are tailored for the apps that you are using. In short, 5-Way Optimization ensures that your PC is perfect for gaming, entertainment, productivity or just about anything else! Fans stay whisper-quiet for everyday computing and ensure extreme cooling efficiency when gaming. Never-stutter in professional apps and heavy loading. With a 4 x PCI Express 3.0/2.0 bandwidth, M.2 supports up to 32Gb/s data-transfer speeds. It is the perfect choice for an operating system or application drive, making your whole PC or professional apps work as fast as possible. With support for both NVIDIA® SLI™ and AMD CrossFireX™ 2/3-WAY configurations, the X99 motherboard enables multi-GPU setups so you can harness the full power of the latest graphics technologies to drive games at 4K and beyond. Remote GO! gives you complete control of your PC — even when you're away from home! Access your forgotten files at home, work on your PC while your are in the traffic or outside. Plus one step to manage all your public clouds or sync files among your PC and devices in a click. Gather your ASUS WebStorage, Dropbox, Google Drive, and Skydrive accounts in one place and even backup to PC at the same time! 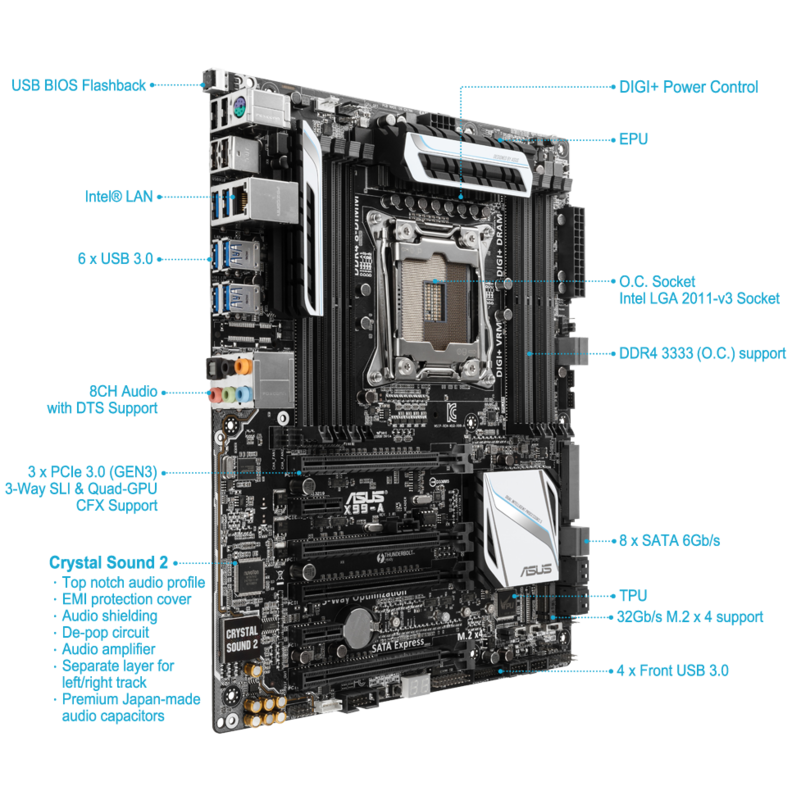 More links for "**B Grade** X99-A Intel X99 (Socket 2011) DDR4 ATX Motherboard"